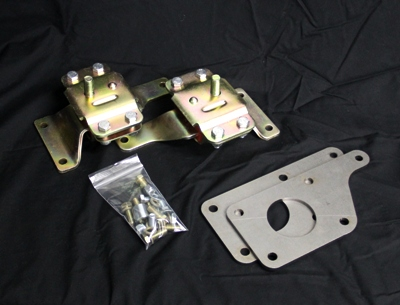 Make your LS engine swap easier with a pair of these UPR Motor Mount Adapter Swap plates and our Urethane 4.6 Motor Mounts for your 1979-2004 Ford Mustang. This plate will bolt to your steel or aluminum LS block and allows you to use a 4.6 Urethane or Solid mount with any K-member that accepts a 4.6 stock style mount. The plate is made of 1/4" thick mild steel and precision laser cut for a perfect fit. No cutting or drilling required and all Grade 10.9 hardware included. 1979 1980 1981 1982 1983 1984 1985 1986 1987 1988 1989 1990 1991 1992 1993 1994 1995 1996 1997 1998 1999 2000 2001 2002 2003 2004 V8 V6 4cyl GT GTS Cobra Mustang Steeda Roush & Saleen Vehicles. Plate bolts to all 4.8L, 5.3L, 6.0L, LS1, LS2, LS3, LS6, LS7, LS9, LSX GM Blocks. No one else can stack up to the bold clean styling of our aftermarket Billet dress ups, Street Strip & Racing Suspension & Performance Parts for your late model American Muscle Car!